Dubai: More than 60 per cent of municipal waste you produce will be converted to electricity that will power 120,000 homes in Dubai by 2020. Dubai Municipality on Monday announced the launch of its long-pending ambitious solid waste-to-energy (WET) project at Warsan area. The Dh2.5billion plant aims to treat 1.82 million tonnes of solid waste annually, Hussain Nasser Lootah, Director General of Dubai Municipality announced at a press conference today. Dubai generates about 8,000 tonnes of municipal solid waste per day. The plant has the daily capacity to treat 5,000 tonnes of it and generate 185MW of electricity. It is capable of providing power to 120,000 homes, equivalent to the consumption of 2,000 skyscrapers equal in the proportion of Burj Khalifa, the municipality said. This is roughly two per cent of the annual electricity consumption in Dubai. Spread across in a two-hectare plot, the plant will become the “world’s largest Waste-to-Energy project operating at one site,” officials claimed. The construction will begin within a few months and the plant will be functional before Expo 2020, said Lootah. “This will give a lot of support to maintain and achieve sustainability in Dubai,” said Lootah. “We are undertaking this project for the development of the city with the cooperation of our partner Dewa (Dubai Electricity and Water Authority),” he said. Saeed Mohammad Al Tayer, MD and CEO of Dewa, said the authority will be the offtaker of the project. Speaking to Gulf News, he said the plant will be connected to Dewa’s grid through HV 132kV cables. “This will be a new source of [power] supply for Dubai. This will improve security of supply,” said Al Tayer. The plant is expected to significantly contribute to achieving Dubai’s Clean Energy Strategy of providing 75 per cent of Dubai’s total power output from clean energy sources by 2050, ultimately reducing the city’s carbon footprint. 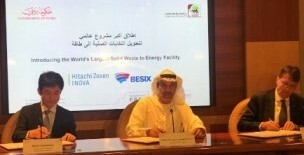 Lootah signed an agreement with senior executives of Swiss company Hitachi Zosen Inova and Belgian construction company BESIX Group which have partnered with the municipality for building and operating the plant. Designed to treat the city’s solid waste as well as industrial and commercial waste, the facility will simultaneously recover the energy and treat the gases generated as a result of incineration. “The waste coming from the bunker will be treated at the combustion room at a very high temperature, 1,200 degrees,” explained Roni Araiji, managing director of Hitachi Zosen Inova branch office in Abu Dhabi. Incombustible material is left as bottom ash, which is 100 per cent recyclable. Metals for metal industry and other construction products can be recovered from this bottom ash. The flue gas then goes through a high pressure steam turbine which harnesses energy and mechanical power is used to generate electricity. The flue gas will be treated with lime and filtered to make the plant environment friendly.